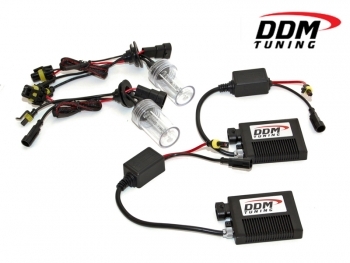 So I got the 55 w HID kit from DDM and I got the harnest too. I`m not the best at electrical work so I`m not sure which plug goes where. Any help? I`m thinking the plug with the blue and white wire goes into the plug that would normaly plug into the halogen light. Is that correct? I dont want to blow my truck up. LOL Thanks guys. Do you have the DDM 55w system? What about the relay harnest? Is this what you have in front of you? Correct but I have the relay harnest as well. I could normaly figure this out but the box didnt come with any sort of scamatic.with the realy harnest, at each end, there is a socket with a red/black and a socket with white/blue. There are two sets of these on each end for both side. They both feed into a relay which I know I have to run into hot, and I have to ground as well. What i`m thinking is I just hook up all the red and blacks from the kits to all the red/black sockets on the relay harnest then the blue/white will go into my head light wire but i`m not sure if this is correct. I;m sry I know i`m probably not makeing much sense but its hard to explain while typing. Thanks for the help though Rc. I ordered there 35w kit. Good prices. Please promote "Install 55W DDM HIDs and need help"